Bring a side-order of fun to family meal times with our range of Tiny Dining Children's Bamboo Fibre Dining Bowls. 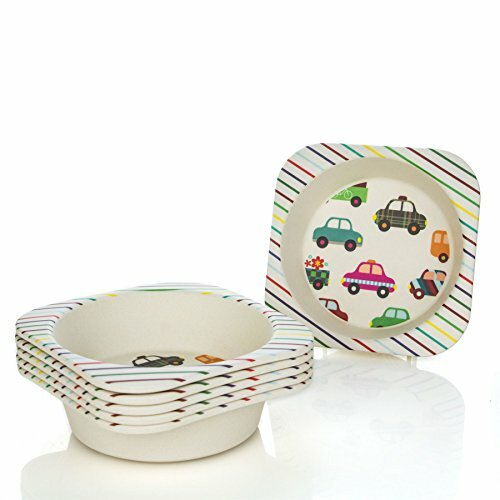 Featuring a charming, vintage-style pattern of cars that is sure to capture the imagination of your little one, this dish is the perfect size for child-friendly portions of cereal, soup, fruit or everyone's favourite, jelly and ice cream! Made from genuine bamboo, these bowls are naturally robust - more than capable of taking a tumble from the table top! - and, better still, are 100% biodegradable, giving peace of mind well after dinnertime is over. With matching plates, mugs and cutlery available, and a range of patterns to choose from, Tiny Dining is the perfect catering choice for diners of all ages! If you have any questions about this product by Tiny Dining, contact us by completing and submitting the form below. If you are looking for a specif part number, please include it with your message.